Sarah Bellin, DPT, graduated with her Doctor of Physical Therapy degree from Marquette University in May of 2010. She also received her BS degree in exercise science from Marquette University in 2008. Sarah works as a physical therapist with United Hospital System in Kenosha where she works both in the inpatient acute & outpatient PT settings. Marfan syndrome is a genetic disorder of connective tissue that is mainly manifested by cardiovascular complications with certain characteristic skeletal components. The incidence rate of Marfan syndrome is estimated to be between 1 in 3,000 to 10,000 individuals worldwide (1). There are varying degrees of severity of Marfan syndrome and if diagnosed and treated properly, a normal life expectancy can be achieved. If an individual with Marfan syndrome is asymptomatic, the diagnosis can often be overlooked by health care professionals. Therefore, physical therapists can play an important role in recognizing risk factors in children with Marfan syndrome and educate the family as well as other health care professionals about the disease. This article will identify key components of Marfan syndrome as they relate to physical therapy practice. Clinical manifestations of Marfan syndrome will be identified as well as medical management and physical activity precautions for individuals with Marfan syndrome. Marfan syndrome can be somewhat difficult to diagnose due to the commonality of some of the clinical manifestations. Currently, the diagnosis of Marfan syndrome is based off of criteria known as the Ghent nosology that was defined in 1996 (2). 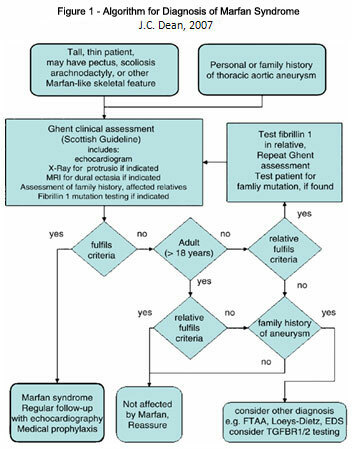 Figure 1 from Dean’s article published in the European Journal of Human Genetics is an algorithm that can help differentially diagnose Marfan syndrome from other related disorders. Although family history is helpful in ruling in Marfan syndrome, around 27% of the cases arise from a new genetic mutation of chromosome 15 (2). Marfan’s syndrome does not discriminate against races or ethnic groups and occurs equally in males and females (3). Women with Marfan’s syndrome have a 50% chance of passing the genetic disease on to their children with every conception (1). It is suggested by Dean that clinical evaluations should be completed periodically in children with suspected Marfan disease until the child reaches 18 years of age (2). The evaluation should pay close attention to family history, the cardiovascular, ocular and musculoskeletal systems. The physical manifestations of Marfan syndrome are widespread throughout the body due to the importance of connective tissue in most of our systems. 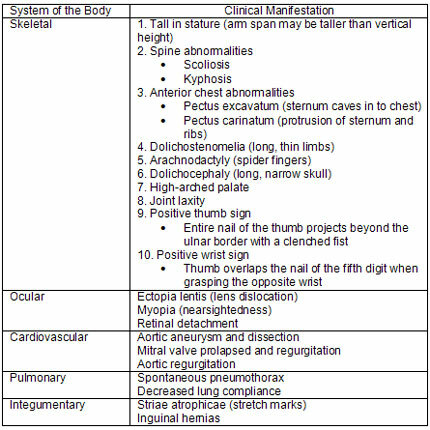 Table 1 displays the most common clinical manifestations that may be present in an individual with Marfan syndrome based on the body system involved. Not all of the manifestations need to be present for diagnosis, but if Marfan syndrome is suspected in an individual; it is necessary to refer to the proper health care professionals for further testing. Children and teenagers that do not know they have Marfan syndrome may unknowingly participate in activities and sports that could put them at a huge cardiovascular risk for aortic dissection and sudden death (4). Therefore, it is increasingly important to make sure Marfan’s syndrome is ruled out in suspected cases. Cardiovascular complications are the most severe manifestations of the disease and may lead to severe morbidity and mortality (3). Medical treatment of Marfan syndrome varies with the extremes of clinical manifestations. Surgical management proves to be an effective solution to the cardiovascular complications of Marfan syndrome. Aortic root dilatation and mitral regurgitation are common surgical indications in children with Marfan’s syndrome (5). Left untreated, these cardiovascular manifestations lead to early mortality in individuals with Marfan disease accounting for 80% of premature deaths (5). Screening for cardiovascular manifestations is important and improved technology, such as the use of echocardiograms, allows medical professionals to properly diagnose and treat the underlying problems. With advanced surgical techniques, cardiovascular problems can be corrected in children thus increasing life expectancy and quality of life in those individuals. Numerous studies have indicated that prophylactic cardiac surgeries have increased survival rates when compared to emergency surgeries for individuals with Marfan syndrome (2). The primary morbidity from operations in children with cardiovascular issues is the need for second cardiac procedure within 10 years (5). Although surgical techniques are more efficient when done prophylactically , people with cardiovascular complications of Marfan syndrome need to be managed with oral medications as well. Beta-adrenergic drugs such as metoprolol, atenolol and propranolol help reduce the rate of aortic dilatation in children with Marfan syndrome (6). Beta blockers help to increase aortic distensibility and reduce aortic stiffness and pulse wave velocity, thus delaying and perhaps preventing dilatation and dissection of the aorta (6). Beta blockers and calcium channel blockers are both effective in decreasing the contractility of the heart and reducing the heart rate to prevent any further damage (1). If beta blockers are not tolerated by the patient, blood pressure can be reduced by using angiotension-converting enzyme (ACE) inhibitors that decrease peripheral resistance to blood flow (1). It is important for individuals with Marfan syndrome to be compliant with their medications to decrease the risk of aortic dissection. Exercise and physical activity are important components in the treatment and management of individuals with Marfan syndrome. Regular physical activity benefits all systems of the body by increasing bone mineral density, lean body mass and overall fitness leading to an increased life expectancy and quality of life. It is important to monitor activity levels of people with Marfan syndrome as they are prone to life threatening cardiovascular complications if the intensity of the exercise is too much for their cardiovascular system to handle. High intensity exercise, isometric activities and contact sports should be avoided in favor of walking, hiking, swimming and cycling to decrease the risk of aortic dilatation and dissection (1). Moderate activity exercise has been shown to safely increased heart rate, stroke volume and cardiac output while decreasing peripheral resistance, thus still achieving a cardiovascular response (1). Heart rate monitoring may not always be an accurate measure of cardiovascular response for individuals with Marfan syndrome due to the widespread use of heart rate reducing medications such as beta blockers. Decreased oxygen also increases the need for proper education and appropriate exercise programs for individuals with Marfan syndrome. Pulmonary function training of young adults with Marfan syndrome using spirometry indicated a 30-50% reduction in peak oxygen uptake compared to a healthy population (1). This deficiency is possibly due to decreased elasticity of lung tissue. Due to this lung compliance issue, it is recommended that individuals with Marfan syndrome should not exceed 50% of their aerobic capacity during activity (1). Cardiovascular and pulmonary functions are just two of the skeletal issues we need to be aware of in the physical therapy setting as we are prescribing exercise to patients’ with Marfan syndrome. Back pain due to kyphosis or scoliosis and joint laxity are also common concerns with Marfan syndrome and may lead the primary care doctors to refer these individuals to physical therapy (4). Interventions for back pain and joint laxity due to Marfan syndrome are similar to interventions for healthy individuals with the same problems. Treatment should focus on pain management as well as strengthening specific muscle groups to help stabilize joints and education to avoid end ranges of motion of lax joints. Axial abnormalities cannot be corrected by physical therapy, but strengthening of muscle groups can help maintain a more upright posture and decrease functional scoliosis (1). Recognizing signs of Marfan syndrome is an important aspect of physical therapy practice especially if you are working with pediatrics and high school age children. It is possible that children will go undiagnosed with Marfan syndrome if they are asymptomatic and a sports injury could lead them to initially start attending physical therapy sessions. If signs of Marfan syndrome are recognized, it is important to refer to the correct health care professional for further testing to prevent associated complications. If not properly treated, premature death may be caused by the severe cardiovascular and pulmonary complications associated with Marfan syndrome. 1) Dennison A & Certo C. Exercise for individuals with marfan syndrome. Cardiopulmonary Physical Therapy Journal. 2006;17(3):110-115. 2) Dean J. Marfan syndrome: Clinical diagnosis and management. European Journal of Human Genetics : EJHG. 2007;15(7):724-733. 3) Amado J & Thomas D. Continuing education. Early recognition of marfan's syndrome. Journal of the American Academy of Nurse Practitioners. 2002;14(5):201-206. 4) Braverman A. Exercise and the marfan syndrome. Medicine and Science in Sports and Exercise. 1998;30(10 Suppl):S387-95. 5) Gillinov A, Zehr K, Redmond J, Gott V, Deitz H, Reitz B, et al. Cardiac operations in children with marfan's syndrome: Indications and results. The Annals of Thoracic Surgery. 1997;64(4):1140-1145. 6) Dean J. Management of marfan syndrome. Heart. 2002;88(1):97-103.